It was a major news event, and it needed to be reported. But shouldn't mass killings of Christians be given the same sort of media coverage? Sadly, we all know that doesn't happen. Whenever there is a mass killing of Christians, it is usually entirely ignored by the mainstream media in the United States, and it doesn't take a genius to figure out why this is happening. Those that control the mainstream media consider Christians to be one of the main obstacles to "progress" in this country, and so any story that would put Christians in a positive or sympathetic light simply does not fit any of the narratives that they are pushing. And of course Breitbart is not exactly "mainstream" media. So why won't anyone else report on this? In only days, a dozen villages in Nigeria's Plateau state were wiped out. The affected communities surround the city of Jos--known as the epicenter of Christianity in northern Nigeria's Middle Belt. I'll bet that most of you had not heard about that until now. Is the anti-Christian bias among the mainstream media so strong that they can't even bring themselves to report the basic facts to us? So why won't the mainstream media talk about any of this? According to charity Aid to the Church in Need, at least 200,000 Christians have gone missing in North Korea since 1953 -- many of those have been summarily executed. As to the specific treatment of those persecuted, the 2014 UN Commission of Inquiry report discovered that the North Korean regime has been guilty of "crimes against humanity." 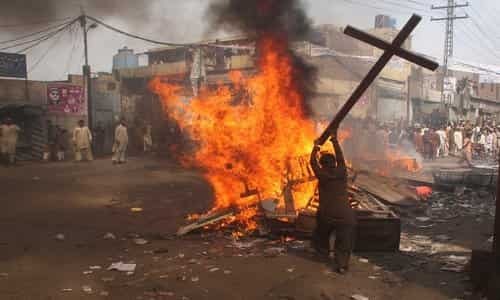 According to Christian Solidarity Worldwide, violent incidents against Christians include "being hung on a cross over a fire, crushed under a steamroller, herded off bridges, and trampled underfoot." If you were to replace "Christians" with some other favored group in any of the examples that I have just shared, you would instantly have front page news all over the planet. The mainstream media is definitely not "independent", and they are not looking out for you. They have their own agenda, and anything that does not fit that agenda does not get to be part of "the news". Instead, when the mainstream media talks about Bible-believing Christians it is almost always an attack story. As a recent Breitbart article aptly observed, having "an anti-Christian bias" has become "the last acceptable prejudice"
They quit reporting "the news" a long time ago, and now it is all about promoting one left-wing narrative after another.